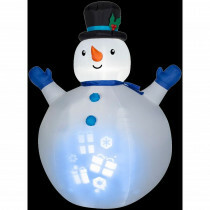 Turn your yard into a winter wonderland with this Panoramic Projection Airblown Inflatable Snowman. This delightful snowman projects a rotating scene of holiday images. Just stake it down, plug it in and watch it light up and self-inflate in seconds.